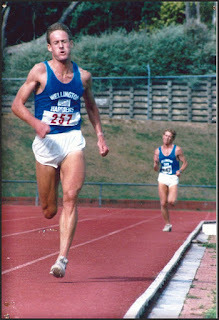 Why is it that elite athletes have roughly ten years of peak performance in them after which the slow decline begins? If an athlete starts training hard at 16, he or she will peak several years later, then slowly decline from their late 20's. If they start at 30, they will peak 5-10 years later and then begin their slow decline. Veteran New Zealand runners like Jack Foster and John Campbell are good examples. Despite being late-comers to the international running scene, both set several world class times in their late 30's and 40's. 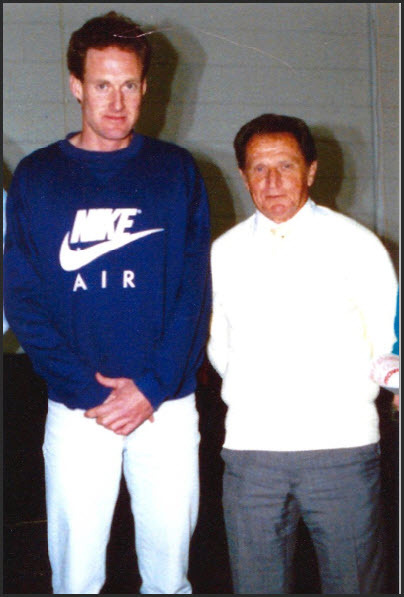 Both had a good ten to fifteen years at the top before gradually losing form. While some of this decline is due to the inexorable processes of ageing, this is not entirely the case as is indicated by the extraordinary careers of late starters such as Foster and Campbell. 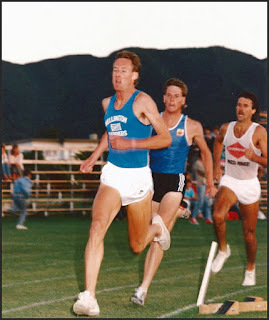 Let me explain what I think happens as athletes get older by referring to the case of former national level runner, Alastair Leslie (Alastair has given permission for his personal information to be used in writing this article). Half marathon - 1hr 7minutes. He raced John Walker, Rod Dixon and other international stars of the 80's before beginning the inevitable slow decline into exhaustion from which he has never recovered. Now 52 years old, Alastair is still feeling distinctly tired -"burned out" - and struggling to exercise enjoyably. Rest has not made the problem go away. Alastair looks remarkably fit and healthy. However, he has tell-tale signs that all is not well - Such as not handling stress quite as well as he might have in the past, insomnia, dry thin skin, poor exercise capacity and constantly tired. He feels like he is "Running on Empty". 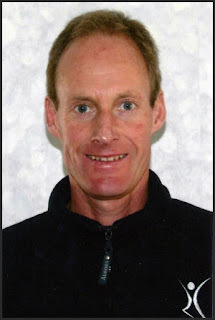 Alastair's Hair Tissue Mineral Analysis (HTMA) highlights several nutrition factors, other than ageing, that may be contributing to his "Tired Athlete" condition. from the body stores and therefore indicate deficiency. Alastair's HTMA (right) is typical of those for tired athletes - He really is running on empty - Most nutrients appear to be precariously low - Ideally, each being within the "Reference Range". 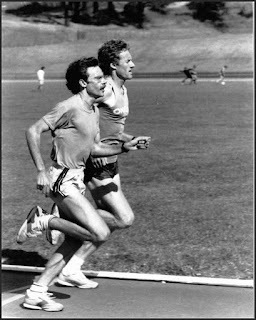 the book, "Healthy, Intelligent Training"
Low magnesium (Mg) and calcium (Ca) may compromise muscle and nerve function. Low sodium (Na) and potassium (K) indicate poor adrenal function and possibly thyroid and blood pressure problems. Low copper (Cu) relative to zinc (Zn) and low manganese (Mn) may lead to weak connective tissue, brittle bones and an unhealthy cholesterol profile. High chromium (Cr) to manganese is associated with insulin resistance and problems with blood sugar regulation. There is more; but I am sure you get the point: There's a lot going on! 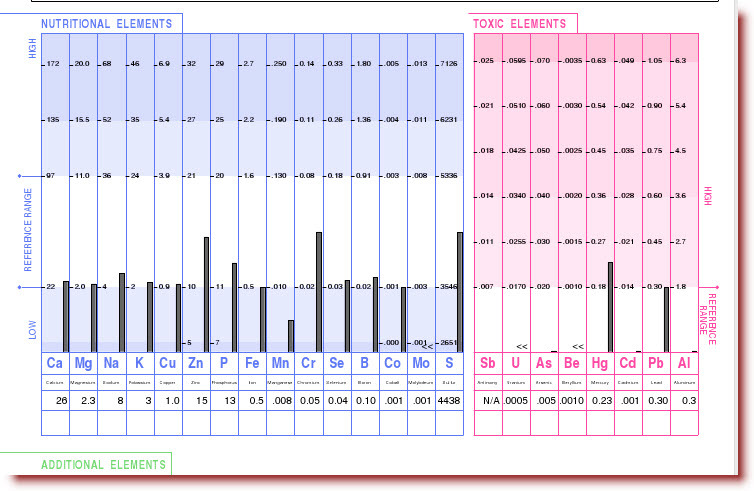 Of interest is the presence of mercury (Hg) and lead (Pb). This is a common finding, presumably due to the contamination of our environment and food chain through the increasing use of chemicals, metals and the burning of fossil fuels. Mercury, in this case, is probably due to eating canned tuna most days, rather than via dental amalgam. Lead contamination can be from many sources, including stripping off old paint during home renovations. Low adrenal and thyroid function may turn a person into and "accumulator" of toxins, rather than being an "excretor"
Lead and mercury bind with nutritional elements such as zinc, iron, calcium, selenium and magnesium, rendering them unavailable for biological use. Mercury's effect on selenium (Se) and zinc, for example, interferes with their role of protecting skin cells from UV damage and preventing chronic inflammation. This process may be a precursor to many cancers, including breast and prostate cancer. My experience with the HTMA is that people in New Zealand and Australia who work with their hands tend to have elevated arsenic, presumably from working with arsenic treated timber. This may partially explain soaring rates of prostate cancer which seems to be affecting tradesmen and farmers more than others. Alastair's HTMA profile is indicative of trends towards depression and fatigue. It is hardly a surprise if a person is tired and grumpy when they are running on empty. We can conclude from Alastair's HTMA that a good deal of what he may be attributing to ageing is actually somewhat controllable. 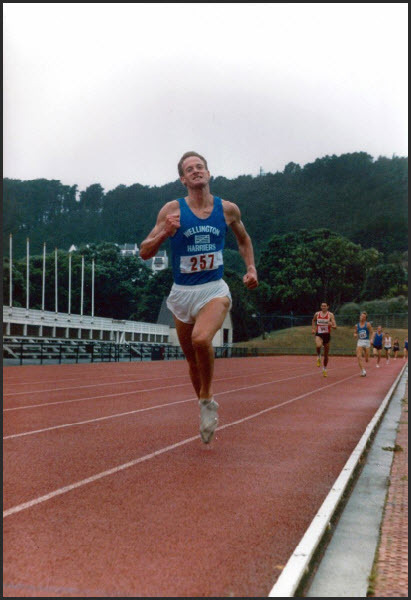 Alastair is gradually restoring his health and running "mojo" through a personalised programme of nutritional balancing. His HTMA helps to take out the guessing of what foods and nutrients to include or exclude. It will be repeated at regular intervals to monitor his progress and to fine tune the programme. Thanks Alastair for allowing us to share your story.